Price listed is for each snap necklace. These are antique silver plated necklaces that adjust from approximately 32-34'' long. These are on a rolo style chain with a lobster clasp and a beaded drop/pendant hanging. 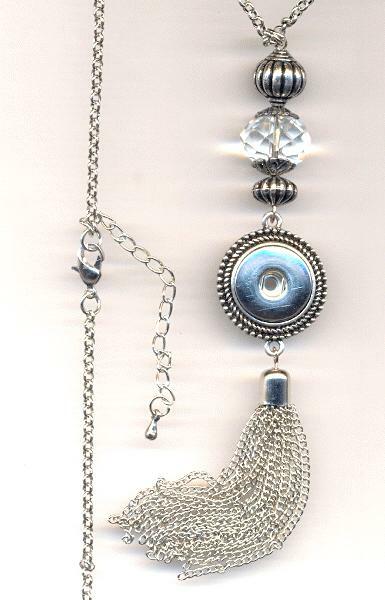 The pendant has antique silver colored beads that measure about 14mm and 11mm with a faceted crystal glass bead that measures about 17.5mm. There is also a tassel at the bottom that measures about 3'' long. The pendant has a snap disc in the center that measures about 18mm. The snap disc will accommodate an 18mm to 20mm snap. These only need a snap of your choice to be complete!